Are you looking for an energy alternative to fossil fuels? Want to go green to help the planet or your family’s future? Maybe you want to save some money on your utility bill? West Coast Solar can help! We strive to serve the greater Sacramento area with solar power systems. We work with our customers to design a custom system to fit their energy needs. Beyond energy consumption needs, the type of system is a factor for all homeowners. Do you want to use solar with a grid tie-in, grid tie-in and a battery backup, or a completely off-grid system? Depending on your energy needs and answer to the type of system you think you want, we can help you go green! 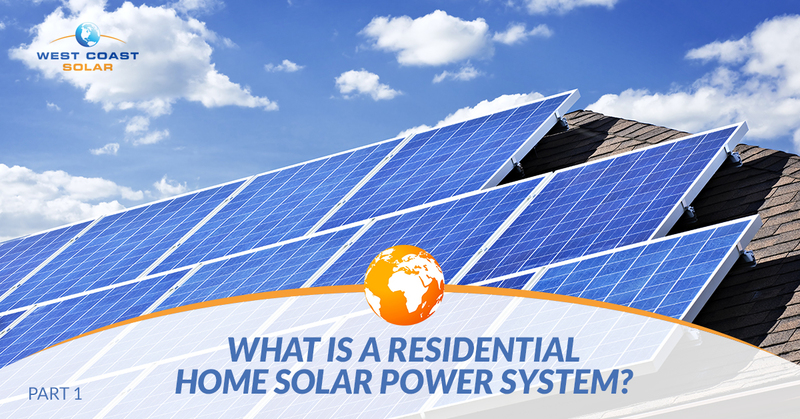 In the following post, we’re going to answer the question, “What is a home solar power system,” and discuss the 3 types of systems available to homeowners. A solar power system is a great way to go green. It can supplement your fossil fuel energy use or completely replace your fossil fuel energy consumption. As mentioned above, depending on your energy needs and goals, you can stay tied into the grid or go completely off-grid with green energy. An entire solar power system is made up of 5 main components and a various number of supporting parts to accomplish one goal: Turn sunlight into usable energy. The panels for your system are used to convert sunlight into usable energy. Technically, the panels knock electrons free from atoms to generate energy flow, otherwise known as electricity. Panels you may see on other people’s roofs are actually comprised of smaller units called photovoltaic cells. These are the smaller squares that do all the work to turn sunlight into direct current (DC) electricity. Once the sunlight is converted into DC electricity, it is sent to the inverter. On all solar power systems, the inverter is what converts the electricity from DC to alternating current (AC). You need AC electricity to power your home, appliances, utilities, and other residential power needs. Once the inverter converts the electricity, it is then sent to the home electrical panel. After the converted sunlight gets to the electrical panel, you will be able to use the energy in your home. Whether you use a corded vacuum, charge your phone, or keep the refrigerator running, you will be using green energy. The second largest impact solar power systems have is at the homeowner’s utility meter. When the customer witnesses their reduced, non-existent, or even credited utility bill after installing their home solar system, their belief and trust in green energy multiplies. Our team at West Coast Solar have seen all three occurrences for someone’s utility bill, and we strive to help all of our customers eliminate their energy bill with the use of a custom designed solar power system in Sacramento. When making a decision on which solar power system is right for you, consider having West Coast Solar design the best solar system for you, your family, and your home. We’ve been serving the Sacramento area for years. Call us today! Continue reading part II of this series to learn about the different types of batteries and backups you can choose from in case of a power outage.